The latest in my ongoing weekend attempts to master* the watercolor medium. 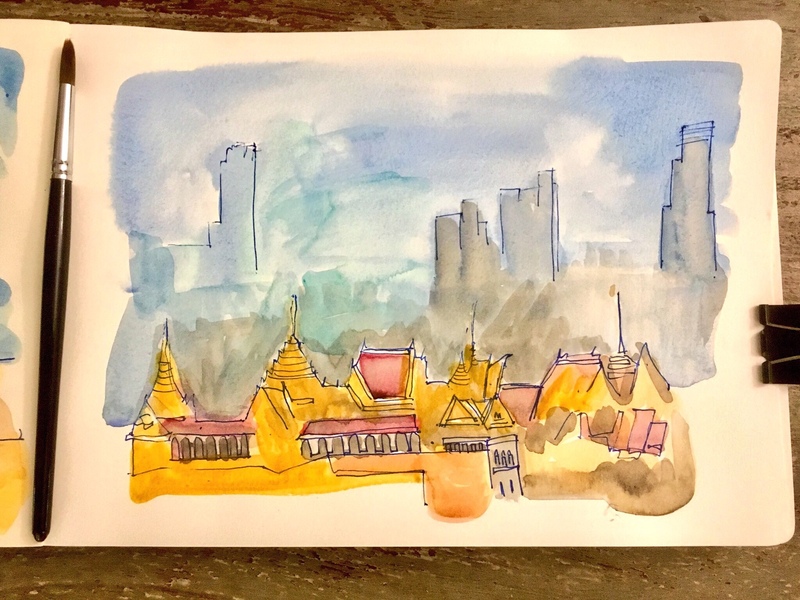 Here we see temples in Bangkok, with skyscrapers in the background, done from a reference photo. I like that I was able to keep everything in proportion in the line drawing. I’d hoped for bolder, more saturated colors, but couldn’t seem to produce them without adding gobs of paint and muddying things up. Perhaps higher quality pigments will help. Watercolor painting is deeply humbling. The colors seem to have a mind of their own, and how they end up appearing once laid done seems highly unpredictable. But that’s also what creates the unexpected effects, which is cool.